After you graduate you can easily export your content from sites.stedwards.edu (Edublogs) and import it into a free or hosted WordPress site. Use Tools> Export from your site dashboard to start the process. You can find free hosting for WordPress at http://wordpress.com/. Most hosting services also support WordPress. 1. Log into your sites.stedwards.edu blog dashboard. 2. Go to Tools > Export. 3. Click on Download Export file and save the file onto your hard drive. 4. Log into your new blog dashboard. 5. Click on Tools > Import. 7. Click on Choose file and browse to locate the Export file you saved on your hard drive. 8. Click on Upload file and import. 9. 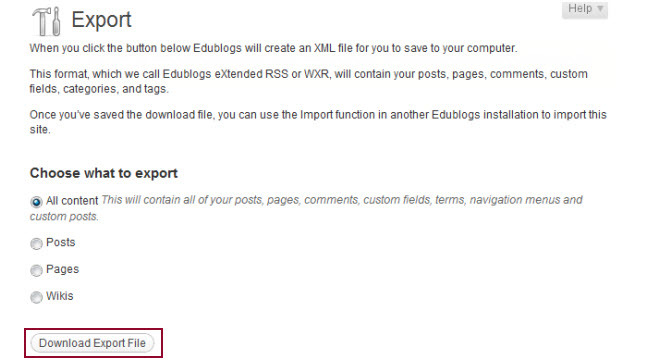 Select if you want to assign the posts to an existing user on the blog or import the autthor. 10. Select ‘Download and import the file attachments‘ and then click Submit. This will import all pages, posts, comments, files. You will need to manually set up your blog theme and widgets.